For Clayton Spencer, Bates College’s next president, the process that brought her here “was not a search at all,” as she told the campus community during her introduction to the college on Dec. 4. And Bates is inclined to love her right back, if the effusively warm greeting that Spencer received during that all-college gathering was any indication. 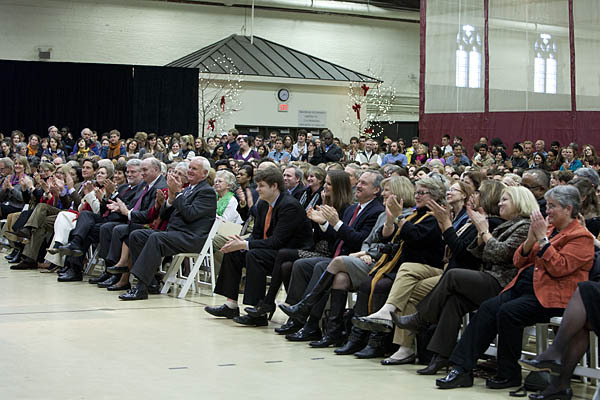 Elected the previous day by unanimous vote of the Board of Trustees as Bates’ eighth leader, Spencer met the college in an event that drew a standing-room-only crowd to the Gray Athletic Building and culminated a week of intense covert preparation and excitement. In her first speech to the college that she will oversee starting July 1, Spencer laid out the challenges facing the college and higher education in general. 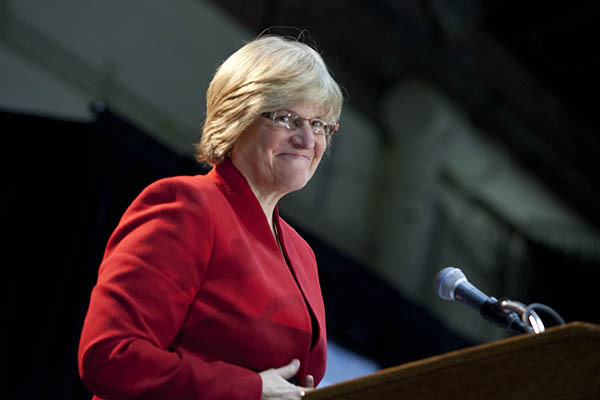 She reminded her listeners of the value of a liberal arts education, and Bates’ bold role in advancing that education. And she offered a call to action, asking the college “to embrace with energy and confidence what the college already does so well, even as we challenge ourselves — always — to do better. Spencer moves into 204 Lane Hall on July 1, 2012. She currently serves Harvard University as vice president for policy — holding, according to The Harvard Crimson, the “most far-reaching portfolio of any Harvard administrator” besides that institution’s president. 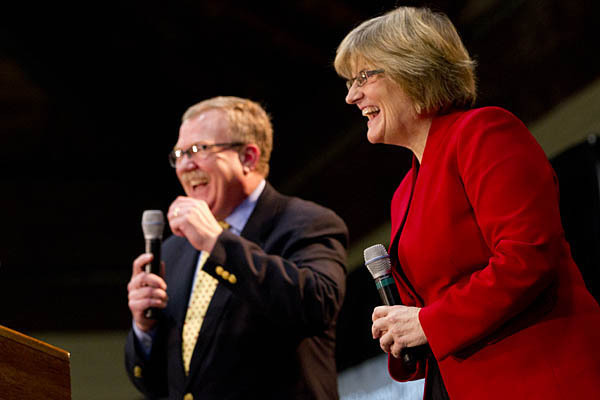 Bates Trustee Chair Mike Bonney ’80, at left, shares a laugh with President-elect Clayton Spencer during her introduction to the campus on Dec. 4. In addition to a record of strategic accomplishment at Harvard reaching back to 1997, Spencer’s resume includes six years of service to the U.S. Senate Committee on Labor and Human Resources as chief education counsel, working with the late Sen. Edward Kennedy. As an educational leader, she has taken on as a central concern the question of making higher education more accessible and affordable. Learn more about Clayton Spencer. The gathering on a sunny, breezy Sunday afternoon was Bates-lavish, featuring jazz by the Three Point Trio, a cappella by the Deansmen and the Merimanders (who blew Spencer a kiss with Stevie Wonder’s “Signed, Sealed, Delivered (I’m Yours)”) and a reception afterward. Nancy Cable, Bates vice president of enrollment and external affairs and the college’s interim president since last July 1, extended a welcome to the crowd filling the Gray Athletic Building. Michael Chu ’80, who co-chaired the presidential search committee with Valerie Smith 75, reviewed the search, and Trustee Chair Michael Bonney ’80 presented Spencer. The Bates community extended an enthusiastic welcome to President-elect Clayton Spencer. As her image flashed onto big screens flanking the stage, Bonney presented Spencer, who was met with the first of two standing ovations she received during the gathering. If issues facing Bates and liberal arts education made up the heart of her address, she made sure to include the personal touch too, mentioning her long affection for Maine — and her awareness of real Mainahs’ feelings about folks from away. She also said “hi” to her mother and father in Davidson, N.C., with the hope that they figured out how to find the live webcast of the event on their computer. Daughter of a historian who served two colleges as president, Spencer said that she “learned very early to prize the special alchemy of people and ideas that communities like this make possible.